This day 7 years ago, I was nearing the end of a cookery and language course at Ecole des Trois Ponts in the south of France. I remember sitting on the terrace enjoying the balmy evening with a glass of wine. It was warm and peaceful. Every now and then the chirrup of the crickets was punctuated by the faraway bang of Bastille Day fireworks. Tout parfait. Now as 14 July rolls around again, my time at the chateau - conjugating verbs and curling quenelles - is a fading memory. And Bastille Day isn't quite the same, half a world away in a grey Melbourne winter. At least I can mark the day in this brand new béret. The pattern I used is a new release from Nicole Mallalieu Design. I had the good fortune to test the pattern before it went on sale this week. Its an absolute dream to sew. Nikki's instructions are so easy to follow and the project itself is lovely and quick. With variations in shape and size, its a lovely versatile pattern. 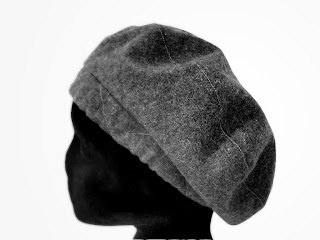 My version - in grey wool with a emerald bemsilk lining - has a medium sized crown depth. And I already have plans for others. I should think you'll be beret glad you did. 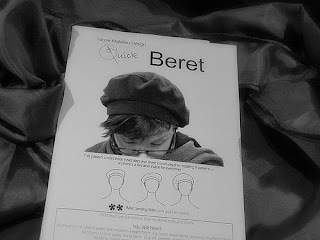 Love the beret - will have to make one. Thanks also for the link. It really looks great! Now you just need a crusty baguette, some stinky cheese and a glass of red and all will be right in the world! I just can't believe you kept this post black and white and didn't show off that stunning lining - my favourite part! Your time in France sounds superb... not quite sure I would have been able to tear myself away from that! It's Tres Magnifique Mon Cheri! My pattern arrived in the mail today, and after trying yours on, I'm very excited to make one too! This looks great on you! I'm going to have to make one given I gave up on the crochet one I was fashioning - so much for donning a beret all winter! Oh! 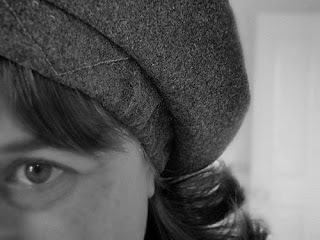 You make me want a beret! Thanks for reminding me.. This day last year I was fighting through the crowds on the Champs Elysee with the family in tow enjoying the excitement of the city and the glorious weather. Today it's raining in Alyth and we are just home from a rainy Scottish holiday. Oh, for goodness sake. I can't type on this laptop. I meant "That'd be...."